You’ve heard the expression, “Bloom where you’re planted.” While I believe it’s a good saying to encourage us to make the best of our circumstances, I also think it’s true that sometimes we simply need to move out of particular situations to improve our lives. If you’re like me, you’re already looking around your garden preparing for Spring and planning what plants you might need to repot or move to a different part of the garden. 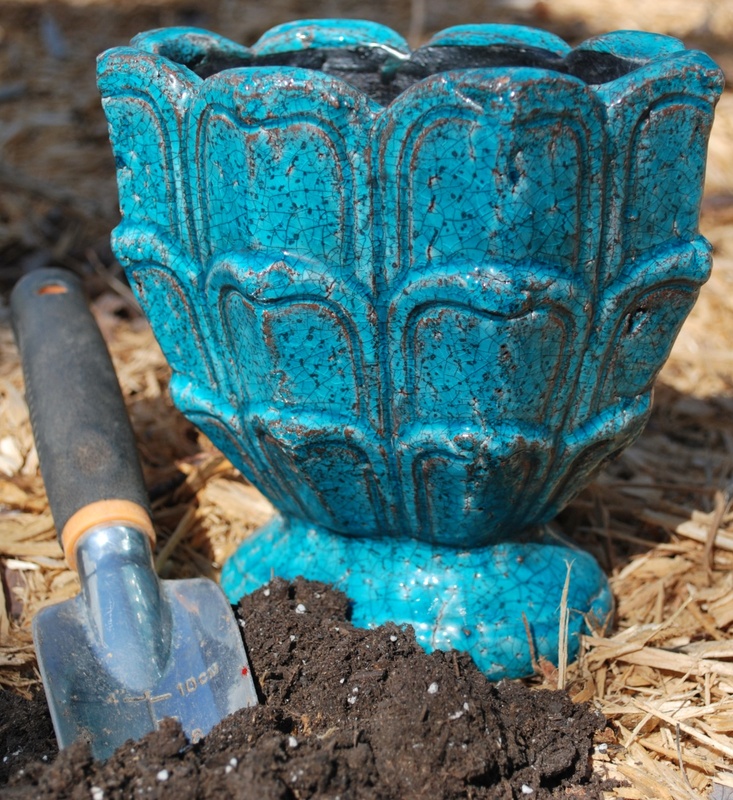 Repotting or transplanting plants can be essential to those plants’ survival. Maybe the pots are too small for their roots to thrive. Maybe their spot in the garden has become too shady for them to grow and bloom and flourish the way they should. The same may be true of your own life. Sometimes staying put and making the best of a situation is simply not the best strategy. Maybe it’s a destructive relationship that we need to leave behind. Or an untenable work environment. Or an addiction to something unhealthy. Or simply a lazy habit. In last week’s post, I gave you 29 reasons to stop procrastinating and make whatever leap you’ve been considering. And I promised a leap of my own: “repotting” this blog from Blogspot to WordPress. So voila! If you have my blog bookmarked, please take a moment to update your bookmark. You might also like to follow me by email (look for the email subscription link at the top right). Subscribing this way means you get every new post delivered directly to your inbox, so you’ll never miss a message from me. If you like a particular post, you can easily share it with others from one of the social media links at the bottom of the post (those little icons for Facebook, Twitter, etc.). There’s also a handy email icon (the envelope) that lets you email this post to your friends. Some of you have asked me before if it’s okay to share these posts with your friends and family. Absolutely! I love the thought of this blog spreading hope and cheer to you and those you love. One of the best features of the new blog is that you should now be able to comment much more easily … from your computer, your iPad or your cell phone. I’d love to hear from you about my blog repotting efforts. Maybe you don’t think it looks any different than the old one. Or maybe there’s some new piece of it you especially like. Please let me know. I’ve worked hard to make the transition a smooth one, and I’d like to hear if you consider it a success or if you encounter problems. Also, as you browse the site, if you come across an old post that was a particular favorite of yours, would you let me know that, too? As I made the transition, I got to review old posts and remember the many challenges and many (more) blessings of the past year. I’ve loved getting to share these bits and pieces of my life with you and look forward to continuing our adventure together on WordPress. This entry was posted in flourishing tree and tagged garden, procrastination, social media, Spring by hopesquires. Bookmark the permalink. Even though i’m just a fantasy gardener, I love gardening metaphors – esp as applied to my often-not-so-bloomy life. Thank you! Thanks, NotWho … I like the Anais Nin quote on your blog: “And the day came when the risk to remain tight in a bud was more painful than the risk it took to blossom.” Here’s to appreciating the blooms and the blossoms when they come. Great job, Hope! The new blog home is very welcoming. I love the vibrant colors of your photographs and the easy access to past entries. Thanks, Laura. Eye candy does make the posts more fun — though the photos are sometimes more challenging for me than the writing. I realized when I was migrating the blog over that the photos really do matter, especially on mobile devices. I’ll try to include photos on more posts in the future. You are forging the way for me! It’s beautiful, Hope. FYI: It looked like my original message had been erased, so I reposted. Not sure if this was just a fluke. Hi, Shannon — thanks for your kind words! I know you’ve considered making this same leap, and I’d say go ahead and do it. It’ll only get more daunting as you have more posts, but WordPress makes it easy to upload your posts and their comments from Blogger. It looks great! I read it on my new iPhone and it downloaded quickly and easily. Great job as usual, Hope!